I have not been able to sit down and write a blog since the election. In all honesty, I have had 4 viruses since Thanksgiving. Some people are calling it “Trumpitis”. What I do know is that cold viruses tend to occur, from one point of view, when there is a great deal of confusion in the mind about an issue. There is often a feeling of being overwhelmed and not able to sort something out. Also, from the point of view of decoding illness based upon the study of German New Medicine, we tend to have more viruses in the winter time because the sun is farther away. Symbolically the sun represents the father principle and when we feel the sun’s distance, as we do in the winter time, there is a aspect of us that feels unsafe and this lowers our systems ability to fight viruses. Whether you believe these ideas or not, we can all agree that people catch more colds and flus in the winter time. I happen to believe that cold and flu viruses do come on due to the emotional/psychological conflicts that I described above. This year, we have more than our share of both confusion as well as a profound collective feeling of WHERE IN THE WORLD IS THE FATHER? Who or what is in actually charge? Like I said, I have had 4 different viruses. Because I believe that illnesses are due to an unresolved emotional conflict, I decided to do a little emotional house cleaning. I decided that the core emotional issue for me was a feeling of “lack of trust.” I then inquired into what was it exactly that I didn’t trust? To say that I don’t trust this new administration is a given. So, I had to go deeper. The deeper that I inquired, I kept returning to the fact that, for me, too much media intake was creating greater confusion as well as a feeling of mistrust of life itself. There were too many stories, too many headlines, too much “breaking news” for me to even begin to digest anything that was happening. My body was telling me that things were out of balance. I had to begin to simplify things in my life. I had to remember to breathe. I had to see and admit that I was actually traumatizing myself. I had to make new choices regarding my day. I had to ground myself in my spiritual practices. I had to listen to more music and read more inspirational books. I spent more time outside taking photographs- one of my precious hobbies. I kept thinking, “Despite it all, I am actually in charge of my own mind”. We all need to do whatever we can to have a voice. We need to protest when necessary. We need to help protect those who need our protection and collective strength. We also need to know that certain karmas have to play themselves out collectively. What we do with our own minds, hearts and bodies in the meantime is what is most essential. This administration has given me an opportunity to work with my own anger. It has also provided me an opportunity to see a collective outpouring of love and goodwill to other human beings. In Buddhism we talk about things co-emergently arising. In other words, neurosis and awake mind arise side by side. You cannot have one without the other. The idea is to transform confusion into wisdom. So, I have decided to not focus on a single person or people- instead, I have chosen to see that change is afoot. There are enormous changes taking place all over the world and I am just one tiny person who gets up and has her coffee and sits down to meditate. There is not a whole lot that I can do except to do what is most vital which is to practice a great deal of self care, to care for others and to not contribute my own feelings of anger into the stream. There are moments where, in my heart, I say, “I love you” to those who frighten me most. Those moments are brief, but they are there. When those moments are there, I feel free. 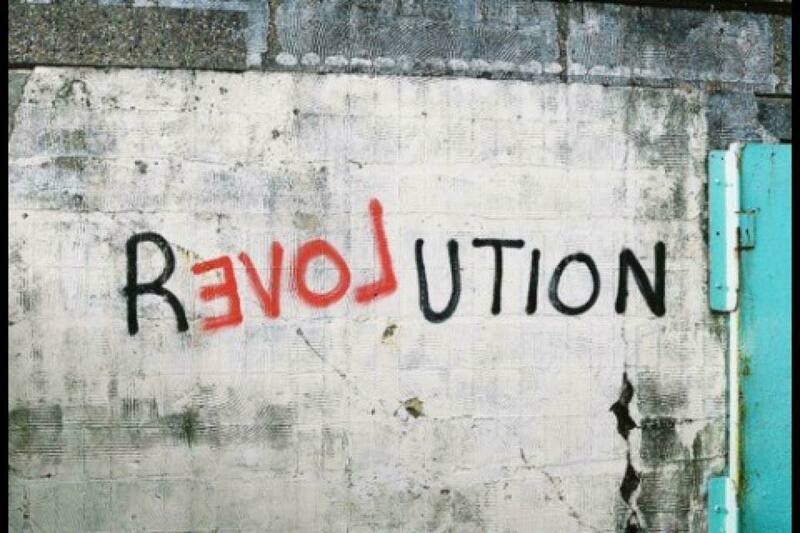 That is the revolution. For me, that is the revolution. In the end, this administration may just, inadvertently, do the opposite of what they intend. They may just, actually, end up bringing us all together. Limit your media intake and this includes all social media. Say “hello” and connect with a total stranger. Smile and wish them good will. Listen to some beautiful music, or, for that matter, some good rock and roll. If you are feeling unsafe and untrusting try using the flower essence Pink Lady Slipper. Smell some essential oils. I happen to like a product called “Cheer Up Buttercup” by NOW essential oils. It is a combination of Bergamot Oil, Orange Oil, Grapefruit Oil and Lemon & Lime Oil. Read STRENGTH TO LOVE by Martin Luther King, Jr., HOPE IN THE DARK: UNTOLD HISTORIES, WILD POSSIBILITIES by Rebecca Solnit, and THE SHAMBHALA PRINCIPLE by Sakyong Mipham Rinpoche. Politely walk away from aggressive conversations. Try to focus on what you see is actually opening up and awakening in society as opposed to what is crazy making and filling up space with various dramas. Keep a journal of gratitude. Do two action items daily to help yourself feel involved and empowered such as writing to your congressman or woman. Become more civically involved. Donate financially to a worthy cause that you believe it. Stay connected with the arts. Art tells the truth and this includes all forms of satire. Also, energy healing is very helpful to balance our nervous system and many people have been coming in for Shamanic Counseling to ask important questions and allow a direct revelation be there own guiding star through these very dark times. Here is a link to a beautiful piece of music by Keith Jarrett. Listen, open up your heart (because the world needs it), light a candle and BREATHE….